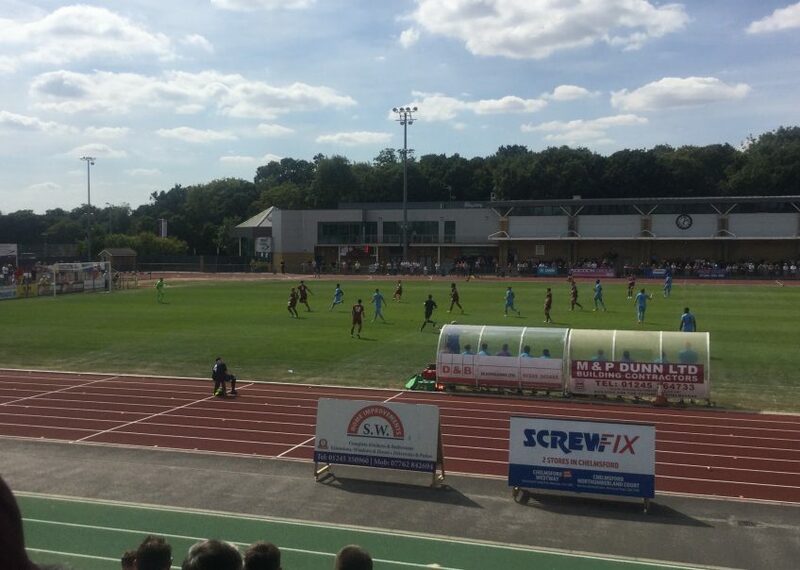 It was no goals and honours shared on the opening day at Melbourne, as Chelmsford City and National League South newcomers Torquay United took a point each in blisteringly warm conditions. The first real effort came from Chelmsford 7 minutes into the match, after Torquay’s experienced midfielder Asa Hall gave the ball away and ex-Gulls loanee Rhys Murphy – one of the City new boys – set off on an excellent run, before being thwarted by a fine save by Shaun MacDonald in the visitors’ goal. Gulls captain Brett Williams had his side’s first shot in the 13th minute, after some good approach play but his strike lacked strength and rolled past the left hand post of the home goal. Murphy again came close for the Clarets on 17 minutes after being set up by fellow summer signing Jai Reason, but once again MacDonald was alert to the danger. City were creating the majority of the chances as the half drew on and Murphy continued to impress, finding himself in a one on one with keeper MacDonald and going close on 36 minutes. But Rod Stringer’s side couldn’t quite find a way through and the match remained goalless at the end of the first half, although Liam Davis went close for the visitors not long before half time. After the break Torquay – cheered on by a sizeable contingent of supporters who had made the long trip from Devon – found the net via Jamie Reid in the 54th minute, but there was a clear offside and referee Alex Blake therefore disallowed the goal. Scott Fenwick had a good chance for the hosts shortly afterwards, putting in a decent cross for Murphy who wasn’t quite able to find the net. 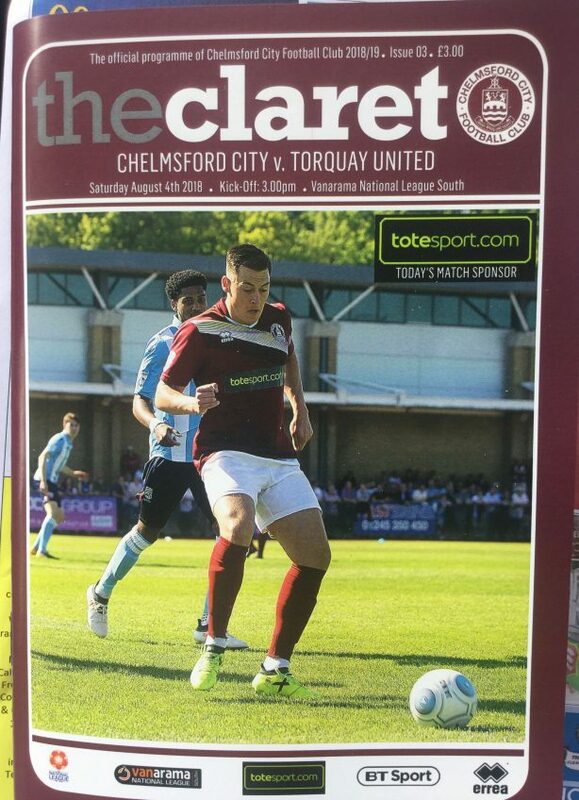 With 11 minutes remaining Tom Wraight, who had worked hard all afternoon down the left flank won a corner for Chelmsford, resulting in Max Porter going close with a long range shot which MacDonald tipped away, and Elliot Omozusi having his subsequent effort tipped over the bar, as the Clarets tried to edge in front. As the match went into time added on the visitors nearly snatched all 3 points when Jean-Yves Koue Niate’s goalbound header beat City goalkeeper Ross Worner, but was cleared off the line by Matt Young. The hot weather made things difficult for both sides but there were plenty of positives for Chelmsford boss Stringer to take from his new look side’s performance, and they were unlucky not to start the campaign with a win on the basis of chances created. On Tuesday the Clarets travel to Dartford, another side who narrowly missed out on promotion last season and where they will hope to obtain 3 points given their recent good record against their old rivals. Torquay United: Shaun MacDonald, Ben Wynter, Liam Davis, George Essuman, Asa Hall, Brett Williams, Jean-Yves Koue Niate, Ryan Dickson, Kyle Cameron, Jamie Reid (Ruairi Keating 60), Chris Regis (Bobson Bawling 77).